Across the course of World War One, 5 Royal Navy warships were destroyed by sudden explosions causing the deaths of 2291 sailors of which 98 were known Irishmen. 38 of the lost sailors were Ulstermen. These ships were HMS Bulwark lost 1914, HMS Princess Irene lost 1915, HMS Natal lost 1915, HMS Vanguard lost 1917 and HMS Glatton lost 1918. 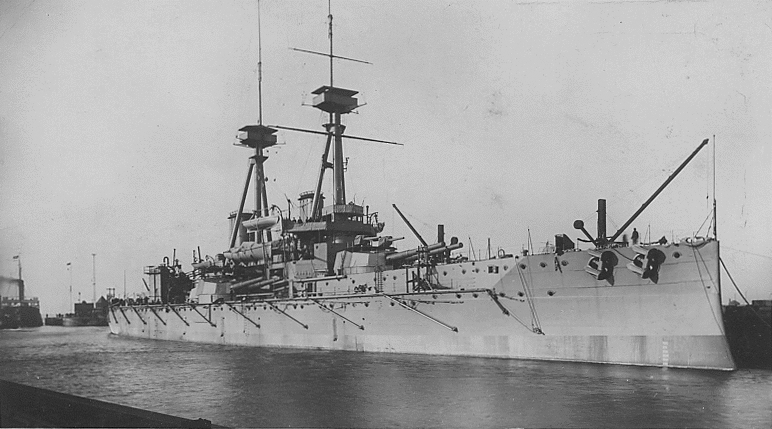 On 26 November 1914, the 15,000-ton battleship, HMS Bulwark was moored on the Medway in Sheerness. While the men on board were having breakfast, the ship suddenly exploded. An eyewitness saw ‘a great volume of flame and smoke shot into the air. The ship seemed to split in two and then heeled over and sank’. The sudden explosion was heard across a 30 mile radius. Once the smoke cleared no trace of the ship remained. The Times lead with the strapline ‘Ship’s company almost eliminated. The Bulwark disappeared in three minutes. The explosion shook every building in the vicinity, and some of the debris was thrown six miles’. The Belfast Newsletter printed an eyewitness statement ‘At first we could see nothing but when the smoke cleared a bit we were horrified to find that the battleship Bulwark had gone’. He continues describing finding a body in the water ‘The poor fellow was terribly mutilated. One arm was torn off and hanging as if by a thread, while the body was terribly cut about. He looked as if he had been dragged for miles over rough stones, His clothing was in shreds and his flesh cut through’. There was considerable damage in Sheerness and more than 700 men on the ship were killed. Winston Churchill reported the disaster to the House of Commons later that day, noting that only 12 had survived. There were rumours of sabotage or enemy action, but Bulwark was almost certainly destroyed after cordite was ignited and there may have been some mishandling of the powder charges. 30 Irish men were killed in the explosion, 7 of them from Ulster. 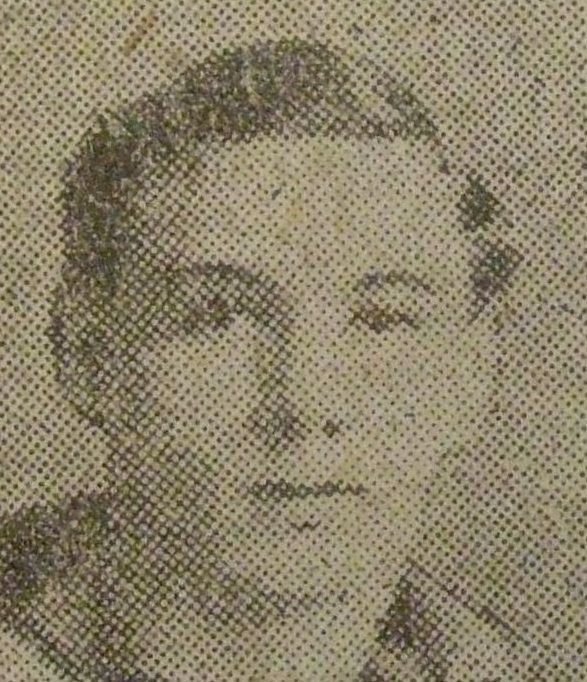 The Ulstermen were: Seaman James Begley of Greencastle, Donegal aged 24, Stoker (1st) Jeremiah Byrne of Kilcar, Donegal aged 38, Seaman Edmund Finn of Red Bay, Antrim aged 34, Able Seaman James Thomas Gardner of HM Coastguard Station, Carrickfergus aged 46, Stoker Hugh Gilmour of Banbridge, aged 36, Stoker William Gray from Hogarth Street in Belfast aged 32 and Lieutenant Alexander Cyril Montagu from Cromore in Portstewart aged 24. Cordite, the propellant that once hurled British bullets and shells, is notoriously unstable and less than six months later there was a second sudden explosion on ocean liner Princess Irene built at Dumbarton in 1914 for Canadian Pacific Railways. 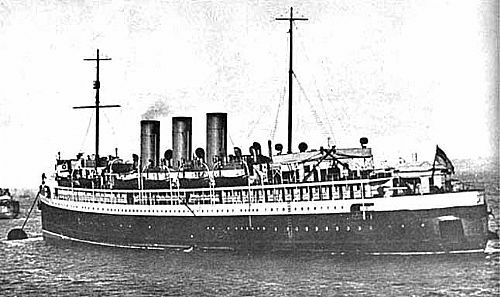 She had been commandeered for war service as a minelayer and became HMS Princess Irene. 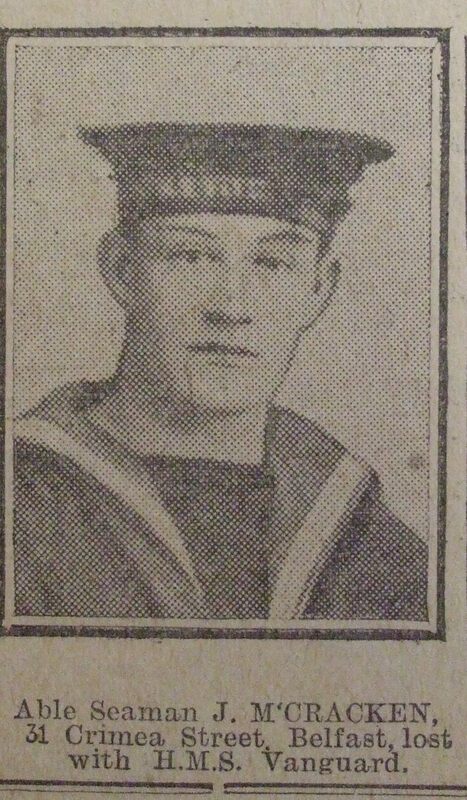 On the morning of 27 May 1915 while in the Medway for a refit, a huge explosion tore through the vessel, shaking the ground for miles around and showering the surrounding villages with bodies and debris. The Belfast Newsletter reported that ‘the explosion…was even more violent than that which accompanied the blowing up of the battleship Bulwark. Flying debris was scattered for a considerable distance, and a number of men on other ships in the vicinity were injured’. ‘A packet of butter which is known to have belonged to the vessel has been picked up in a garden in Newington, which is about 8 miles as the crow flies from Sheerness, and at the same place two towels bearing the words “Allan Line”, were picked up along with a large piece of wood bearing marks that it belonged to the Princess Irene’. One mechanic working on a ship 1000 yards away was hit by debris and died the following day, and a little girl aged 9 was picked up dead on the Isle of Grain having been struck by a piece of iron from the ship. On Princess Irene 200 men died, along with 78 shipwrights, apprentices, skilled labourers and boys from nearby towns and villages. Once again sabotage was suspected, but the conclusion was that the mine charges were unstable and were awaiting replacement. 19 Irish men were killed in the sudden explosion, 6 of them from Ulster. 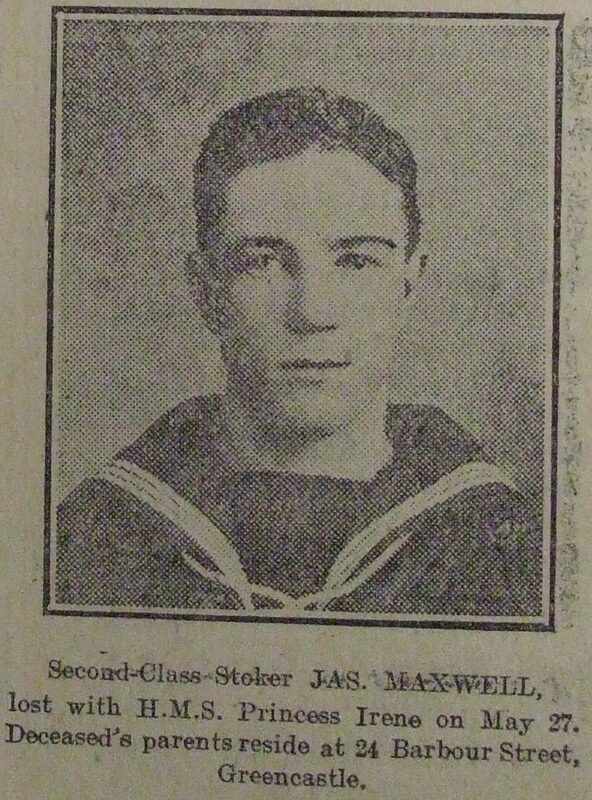 The Ulstermen were: Stoker (2nd class) James Larmour from Lilliput Street, Belfast aged 19, Stoker (2nd class) James Maxwell of Barbour Street, Greencastle aged 20, Able Seaman John McAdorey of Garmoyle street, Belfast aged 30, Stoker 2nd class Matthew McEnroe of Union Street, Derry aged 19, Leading Stoker John Carleton of Belgrave Street, Belfast aged 23 and Stoker (2nd class) Alexander McMurray of Bangor aged 22. 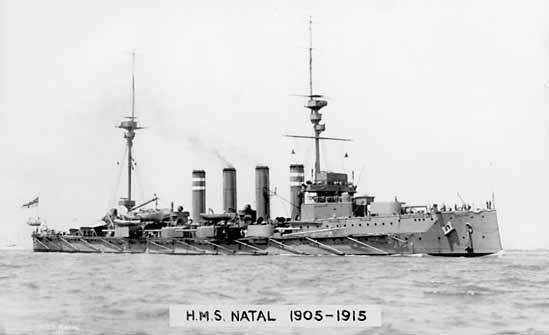 Just over six months later another explosion occurred near Cromarty, Firth on HMS Natal, a Warrior-class armoured cruiser. On 30th December 1915 the Captain was hosting a Christmas film show on board the warship. Invited along were wives of officers and nurses from a nearby hospital ship. Just as the party was starting at around 3.25pm, a series of massive explosions tore through the rear part of the ship and she capsized within 5 minutes. Reports that she had been torpedoed by a German U-boat or detonated a mine were proven false when examinations of the wreckage revealed that the explosions were internal. The Admiralty court-martial concluded that the explosion was caused by an ammunition explosion, possibly due to faulty cordite. The Admiralty issued a list of the dead and missing that totalled 390 in January 1916, but did not list the women and children on board that day, perhaps embarrassed by the loss of non-combatants. Losses are now listed between 400 to 421 people. 17 Irish men were killed in the explosion, 9 of them from Ulster. The Ulstermen were: Boy 1st class Francis Pasteur Goodman of Keady, Armagh aged 17, Stoker 1st class William McConkey of Agnes Street, Belfast aged 20, Armourer’s Crew John Stratton of Portadown, Armagh aged 20, Stoker 1st class William Walsh of Spamount Street, Belfast aged 26, Boy 1st class Robert Woodney of Queensland Street, Belfast aged 17, Able Seaman Henry McKee of Malone Road, Belfast aged 24, Carpenter’s Crew Thomas McKeown from Cookstown, Tyrone aged 23, Engine Room Artificer 4th Class Nathaniel Taylor from Rockvale, Katesbridge aged 22 and Stoker 1st class Thomas Newell of Lachagh street, Belfast, aged 22. 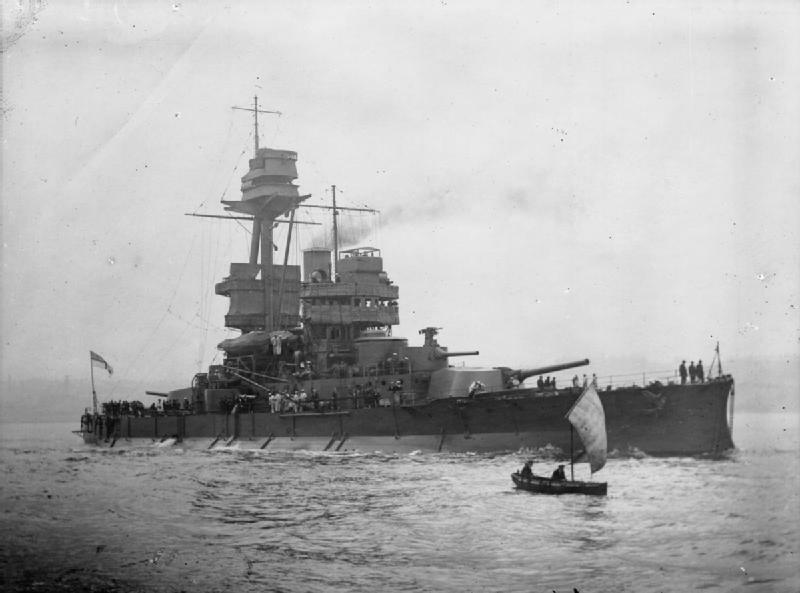 HMS Vanguard was a St Vincent-class dreadnought battleship built for the Royal Navy in the first decade of the 20th century. She spent her whole career assigned to the Home and Grand Fleets. Aside from participating in the Battle of Jutland her service during World War I generally consisted of routine patrols and training in the North Sea. Just before midnight on 9 July 1917 at Scapa Flow, Vanguard suffered an explosion caused by an unnoticed stokehold fire heating cordite stored against an adjacent bulkhead in one of the two magazines which served the amidships gun turrets. She sank almost instantly, killing an estimated 804 men with only two picked up alive. In terms of loss of life, the destruction of the Vanguard remains the most catastrophic accidental explosion in the UK, and one of the worst accidental losses of the Royal Navy. 30 Irish men were killed in the explosion, 15 of them from Ulster. 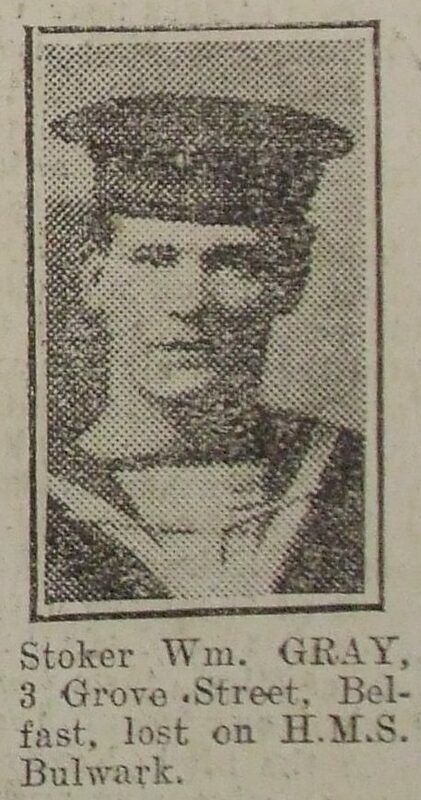 The Ulstermen were: Ordinary Seaman Alexander Baird from Upper Meadow Street, Belfast, aged 19, Stoker John Devine from Ballymoney, aged 32, Ordinary Seaman William Harvey, from City Street, Belfast, aged 18, Able Seaman Joseph McCracken of Crimea Street, Belfast aged 26, Stoker 1st class Samuel McIlvenny from Stratheden Street, Belfast aged 24, Naval Schoolmaster Hugh Robert Murray from Halliday’s Road, Belfast aged 22, Stoker 1st Class, William George Reid of Mervue Street, Belfast aged 23, Carpenter’s Crew Charles Magee Thompson from Gracehill, Ballymena aged 23, Midshipman Randal William McDonnell Johnston from Glynn, Co Antrim aged 17, Carpenter’s Crew Bernard Ferris from Co Derry, aged 22, Stoker 1st Class Hugh Fisher from Portaferry, Co Down, aged 27, Able Seaman Samuel Montgomery McCargo from Co Antrim aged 21, Carpenter’s Crew John Wilson Adams from Spittal Hill, Coleraine, aged 29, Stoker 1st class Thomas Rainey Agnew from Spamount Street, Belfast aged 23, Shipwright 2nd class John Neville from Cregagh Road, Belfast aged 37. HMS Glatton and her sister ship Gorgon were originally built as coastal defence ships for the Royal Norwegian Navy, as Bjørgvin and Nidaros respectively. She was requisitioned from Norway at the beginning of World War I, but was not completed until 1918 although she had been launched over three years earlier. On 16 September 1918, before she had even gone into action, she suffered a large fire in one of her 6-inch magazines. Attempts to deal with the fire failed and she had to be torpedoed to prevent an explosion of her main magazines that would have devastated Dover as well as other vessels nearby loaded with oil and ammunition. It was found that the piling of clinker against the magazine bulkhead provided the source of the ignition of the cordite causing the explosion. Her wreck was partially salvaged in 1926, and moved into a position in the North Eastern end of the harbour where it would not obstruct traffic. It was subsequently buried by landfill underneath the current car ferry terminal. 2 Irish men were killed in the explosion, 1 of them was from Ulster. 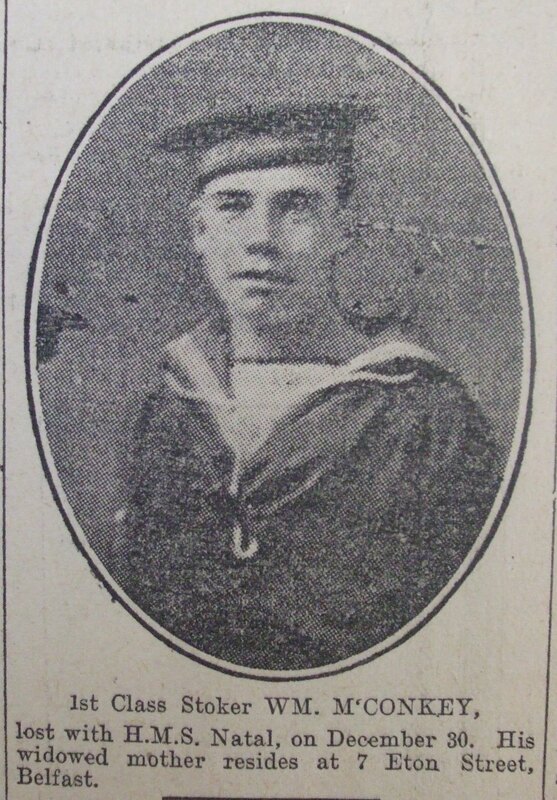 The Ulsterman was: Able Seaman William Thomas Brown of Jonesboro Street, Belfast aged 20. These five ships, needlessly lost during the First World War were not the victims of enemy action but rather the mismanagement of explosives and at least 2291 lives were lost. A list of known Irish men on board these ships is available by contacting me by email. There were 5 other Allied ships lost during the war to explosions. Italy lost the battleships Benedetto Brin and Leonardo-di-Vinci. Japan lost the battleship Kawachi and the battle cruiser Tsukuba and Russia lost the battleship Imperatritza Maria. A cordite explosion also occurred on board the Chilian ship Capitan Prat however this did not lead to the loss of the ship. 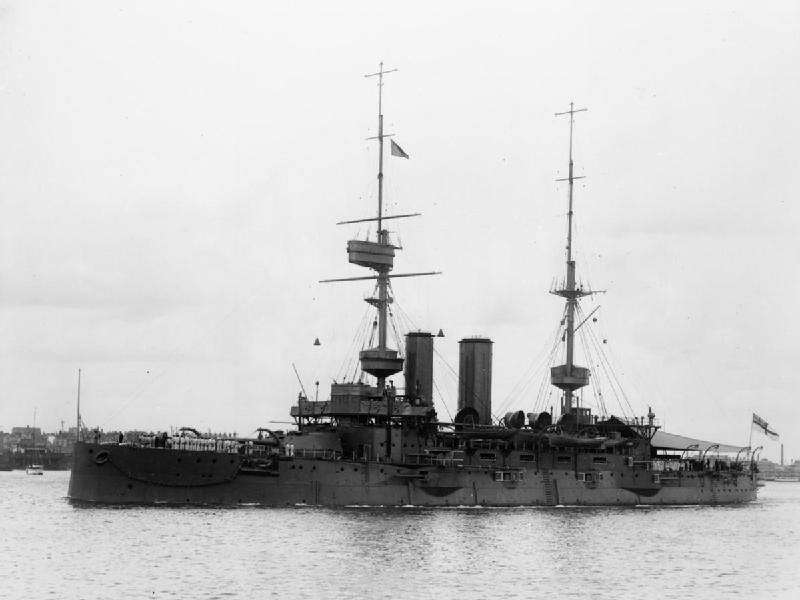 In addition cordite handling problems caused 3 battlecruisers to fatally explode during the Battle of Jutland in 1916.